Prime Minister Narendra Modi is to be commended for giving a deadline for the merger of PIO (Persons of Indian Origin) and OCI (Overseas Citizen of India) status. This will meet a long-standing demand of the Indian diaspora. It also brings clarity to the issue since there was not much difference between the two statuses. While he had announced the merger of the two in September during the US visit, now he has declared that the two will be merged before the Pravasi Bhartiya Divas scheduled for January 7. Since gender inequality is embedded in our socio-cultural matrix, loopholes in laws, especially in those pertaining to marriage, are often misused to deny justice to women. The Law Ministry has circulated a draft note on the Marriage Laws (Amendment) Bill for inter-ministerial consultations. After the feedback, it will be tabled in Parliament. It is on the lines of the Bill which was passed by the Rajya Sabha in 2013 but lapsed on the dissolution of the Lok Sabha. WITH reference to the appointment of a seventh Judge to the Punjab Chief Court temporarily for six months solely to carry on the work of inspecting the subordinate courts it appears to us that the temporary arrangement will not hold and that the appointment should be made permanent. We gather from the latest report on the administration of criminal justice in Lower Burma that Mr. Justice Hartnoll inspected the District and Special Power Magistrates' Courts and 13 other Courts in one district and two courts in another district; and that Mr. Justice Twomey inspected the courts of the District Magistrate, Senior Magistrate, Special Power Magistrate and ten other Magistrates in one District. TWO boys have been killed in Kashmir. The incident itself is bizarre. A white car is mistaken for the one which used to carry terrorists back and forth. As many as 115 bullets were fired at the car in one go. The only surviving passenger, a boy, emphasised how the incessant fury did not stop even after the car hit a tree to come to a halt. The wait for a new season is often problematic for me. It becomes difficult to decide when one season has gone and the new one has arrived. Not long ago in my village people had definite cut-off dates. During my childhood days in Jandiala, a village near Jalandhar, from Diwali onwards whatever be the temperature the whole village would start using cozy quilts. It used to be a very colourful scene to see quilts spread in the sunshine for two or three days before Diwali. But in a city like Chandigarh it is very difficult to convince the educated ladies of the house to take out even light blankets on the Diwali night. “The Diwali night is always hot” is their usual answer. Why do farmers still continue to burn rice/wheat stubble despite the ban imposed on this practice? Perhaps it is the lack of cost-effective alternatives that prevents them from exploring other options. Rice or wheat straw, generally termed as stubble, has been in the spotlight for the last few years. As it is being burnt in the fields despite an increasing awareness about the resultant environmental pollution. There are side-effects even at faraway places and many articles appear in the media and suggest measures to control or stop it altogether. Still farmers refuse to pay heed. Scientists and officers of the government come to farmers with many technological innovations and cite laws that prohibit stubble burning, but it is of no avail. The Indian diaspora had for long found it difficult to make a choice between the two. The PIO scheme started earlier, and there was some difference in the eligibility of the two programmes, with the OCI scheme being more liberal regarding origins of citizenship, restricting access only to Bangladeshi and Pakistani citizens. On the other hand, the foreign-born children of parents who were both Indian citizens are eligible only for the PIO card, whereas for the OCI card, one of the parents must be a foreign citizen of Indian origin. Such distinctions abound. The merger of the two schemes is also in sync with Modi's policy of simplifying laws and procedures. Modi has also announced that the visa on arrival facility will be extended to Australian tourists. This too is likely to give a fillip to the tourism sector, since it encourages more travel. The Prime Minister has wooed Australian businesses with some degree of success. He has also reached out to the diaspora that now calls Australia his home. His has sought the help of Indians abroad in improving sanitation. Many villages in Punjab have benefited from the assistance given by the Indian diaspora, especially one based in Canada and the US, which has helped improve the basic sanitation in targeted villages. With others joining in, it is likely that the movement may catch on and thus help provide the basic facilities that all Indians need. Prime Minister Modi's overseas outreach has generated interest and changed perceptions about India. As he delivers, he can expect more success to follow. Since gender inequality is embedded in our socio-cultural matrix, loopholes in laws, especially in those pertaining to marriage, are often misused to deny justice to women. The Law Ministry has circulated a draft note on the Marriage Laws (Amendment) Bill for inter-ministerial consultations. After the feedback, it will be tabled in Parliament. It is on the lines of the Bill which was passed by the Rajya Sabha in 2013 but lapsed on the dissolution of the Lok Sabha. The proposed Bill will enable both parties to file for divorce on the ground of “irretrievable breakdown of marriage” and seeks to alter the Hindu Marriage Act, 1955, and the Special Marriage Act, 1954. Prolonged legal battles in divorce cases are often traumatic and financially draining. The provision for sufficient compensation for the wife and children from the husband's immovable, inherited and inheritable property once a marriage legally ends is welcome. Since women are rarely single owners of assets and property, they are often shortchanged when a marriage breaks down. Courts will also be empowered to exercise discretion in granting divorce after three years if one of the partners does not move a second “joint application” for divorce with mutual consent. Grounds for seeking divorce range from adultery, cruelty, desertion, bigamy to certain sexual offences. It is appropriate that the grant of divorce should not be given only due to “the fault of the party.” Sociologists, lawmakers, activists and reformers have debated the issue of “irretrievable breakdown” of marriage in the Indian context. The provisions might make it easy for men to desert their wives without assigning any reason. However, a paradigm shift in the perception of marriage and its role and function does necessitate fresh laws. Even in a kinship-based culture as ours where society has a stake in it, marriage is no longer perceived as a sacrament. It is being viewed increasingly as a contractual relationship between two freely consenting individuals; so it is only befitting that laws mirror societal changes. WITH reference to the appointment of a seventh Judge to the Punjab Chief Court temporarily for six months solely to carry on the work of inspecting the subordinate courts it appears to us that the temporary arrangement will not hold and that the appointment should be made permanent. We gather from the latest report on the administration of criminal justice in Lower Burma that Mr. Justice Hartnoll inspected the District and Special Power Magistrates' Courts and 13 other Courts in one district and two courts in another district; and that Mr. Justice Twomey inspected the courts of the District Magistrate, Senior Magistrate, Special Power Magistrate and ten other Magistrates in one District. The work of the Lower Burma Chief Court in respect of Criminal appeals and revisions is light in comparison with that of the Punjab Chief Court. Nevertheless the Hon'ble Judges between them could find time to inspect the courts of only three districts; and they call special attention to the fact that most courts remained uninspected by Session Judges and District Magistrates and that the amount of inspection done by the Sessions Judges was very small. COTTON cultivators in all parts of India will doubtless experience hard times since their cotton stock cannot be sold profitably during the war. But they have to pay the usual land assessment fixed years before on a basis of 30 years' average. The cost of necessaries of life has also increased and altogether the cotton cultivators' position is anything but enviable. It is possible that great distress will prevail among them and Government will, we hope, be able to give them such help that is possible under the circumstances. The Army has accepted the mistake. The agility with which it has done so indicates that the gun crazy among them was spotted immediately. A full inquiry, already ordered, may serve the truth. Yet it would not go beyond telling who killed whom. The bigger picture may still not come out. The truth is that New Delhi does not want to face the facts. Two things emerge from the incident. One is the continuous use of the armed forces for internal security and, two, the cursory manner in which cases are handled. The alienation of the valley is loud and clear. But this is nothing new. Nor is the laxity of the administration. However, what is new is that the hard or soft administration has made little difference. The malady is deeper. One development is that people are confused over the status of the Army in their midst. They have hated it as if it was a sort of an occupational army. Its support to the bumbling administration has been a point of contempt. Yet the manner in which the Army helped the people during the unprecedented floods has won their hearts. The Army not only rescued them and saved their belongings but also gave medical aid to thousands of those affected by the floods. It even fed them for weeks and reached the cut-off areas to rescue hundreds of people from their sequestered places. Their picture of being tyrant has, no doubt, receded a bit. But their presence is a point of criticism. Chief Minister Omar Abdullah is, indeed, trying to strengthen the state police to cope with the internal law and order problem. Yet, whenever the Army is used to curb an unruly situation, New Delhi gets a bad name and much is made about it. 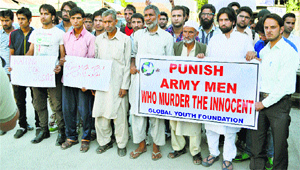 Both Srinagar and New Delhi have depended for too long on the Army to suppress a situation of a larger proportion. They will have to ensure that the Army is used for protection of the border, not for untoward incidents within the state. This is a negation of democracy which we should be ashamed of. The Constitution, which rules the country, provides equality to all citizens without recognising identity, caste or creed. The still uglier situation is that scores of young people are not traceable. Terrorists can be blamed for picking up some for the purpose of brainwashing or exacting ransom. But the number is said to be limited. The people’s perception is that there is New Delhi’s hand behind the disappearance of these young people. This impression gets deepened when the cases relating to disappearance are not convincingly explained, when the overall supervision is the responsibility of the Central government. All these require transparency, particularly when there are cases which never came to light or were half-heartedly pursued in law courts. Had there been the institution of Lokpal, which is non-existent because of political manoeuvres, the matter would have found some attention. We now have to depend on the sensitivity of political parties for action. In fact, they are the ones who have their representatives in Parliament, the ultimate authority. Alas, that is very much missing. Engaged as they are in political manoeuvering, the parties have forgotten the immediate requirement of the country. The lower half needs to be brought into the mainstream so that it would feel that the country as much belongs to them as to the upper half. A betterment without distinction was promised during the Independence struggle. I recall it was said from the rooftops that Independence would bring food, shelter and employment to all the people in the country. Mahatma Gandhi had said that the rich would only be the custodians of the wealth meant for all. Pandit Jawaharlal Nehru, another icon of the freedom struggle, talked of socialism. Nehru, who ruled the country for 17 years, promised that the public sector undertakings would attain the commanding heights so that the small-scale industries in the country got a fillip. But all these have remained only on paper with the bungling bureaucrats and greedy politicians making a mess of the whole concept. The subsequent governments, whether belonging to the Congress-led front or the BJP, promised a lot but delivered very little. The plight of the common man did not improve. And the same result emerged: the rich getting richer and the poor getting poorer. Prime Minister Narendra Modi also assured a lot to the people during his election campaign. With 282 seats in the Lok Sabha, an absolute majority, he should be able to take some steps to transform the country. His spell is receding but people are still hoping against hope that he would do something. Changes requiring legislation may be a bit late to come. But the administrative measures can be taken straightaway so that there is some difference in governance. Understandably, Kashmir will take time. But at least the Modi administration can convey that there is a change in the offing. The Armed Forces (Special Powers) Act requires reconsideration. The powers given to the armed forces to kill on suspicion are too sweeping for a democratic country. The killing of two boys should at least goad the government to have another look at the act. When even 10 days after the festival a blanket was denied to me, I was suddenly reminded of the arrival of the winter when my son asked for a new coat. “From tomorrow I have to go to school in the winter uniform”, he declared. While going to, and coming back from the market, I felt tomorrow morning would be a chilly one. “Should I wear a coat?” I wanted to know. “I think you should, but you can do without it too”. The answer left me no wiser. A photograph of the snow-clad mountains in one newspaper and the news about the closure of the Leh-Manali road due to heavy snowfall further added to my dilemma. Like a cricket umpire going for the pitch inspection, I once again went out to have a feel of the cold. This time I came back with a firm decision to wear the coat for the first time in the winter of 2014. Perhaps, the venue of this inspection was the same from where I said 'bye' to my son about half an hour ago. While driving from my residence to the sector 43 bus stand, from where I usually take a bus to Patiala, I looked at people around. To my dismay, only a very small number of people wore sweaters and jackets, but none had a coat. After this quick survey I thought of leaving the coat in the car, but after seeing a good number of people wearing woollens , I changed my mind. “Oh, the locals do not need to wear the woollens, but the travellers definitely require them,” I concluded. “But from this bus stand buses also go to Himachal and the people in the winter dress might be Himachalis’ and not Punjabis’”. When I made some close observation, my confusion level again increased. By this time it was too late to go back to the parking to leave the coat in the car. Therefore, I hurriedly got into the bus that was about to leave. Of the 30-odd passengers, I counted, five were wearing woollens. In that not very cold but confused morning, it was a satisfactory number. 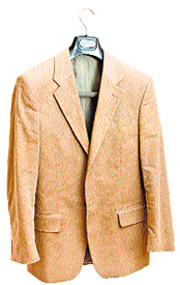 When I entered the Punjabi University campus, which is my workplace, I again became conscious of my coat as the Patialvis were not very different from Chandigarhians in this matter. I never imagined that my first winter dress would cause so much mental noise. The first set of four-five students entered the class, but none of them was in the winter mode. “They are young and locals,” I tried to console myself. But when all the remaining students came and got seated, and some of them in half-sleeve shirts and T-shirts, I removed my coat and hanged it on the back of the chair. And my first ‘winter’ class ended with a hot laughter. There is a need to offer easy and cost-effective solutions to farmers so that they avoid burning stubble. Farmers take the easy way out due to the lack of awareness about options. When I remember my childhood days, rice or wheat was grown in our fields but those days stubble was considered a valuable byproduct of agriculture. Not even a single straw was wasted. Though rice cultivation in hills has declined due to the lack of interest of present-day farmers involved in agriculture but not by choice. Rice cultivation needs a lot of labour/hard work, water and its management. What is the law-&- order scenario? The burning of stubble is a punishable act under the law. The Punjab Pollution Control Board and the state Agriculture Department have been spending crores annually on awareness campaigns against the menace. When the state harvests paddy or wheat, the government issues advertisements in major newspapers, appealing to the farmers not to burn the left-over stubble. These orders, however, go up in smoke as farmers do not care two hoots for such diktats. Despite the imposition of Section 144, the police is yet to book even a single farmer under Section 188, though it is a bail able offence. 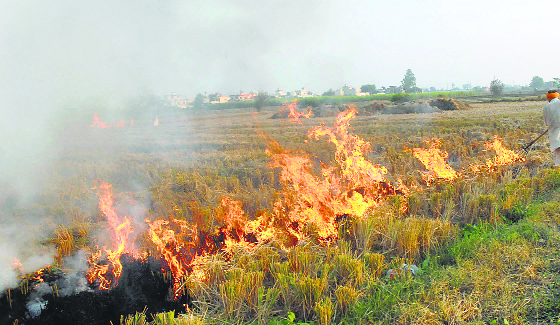 Paddy stubble burning seems to have acquired political colours as police officials claiming that they are under pressure from politicians not to book erring farmers. Agriculture experts say burning the stubble threatens soil fertility, kills eco-friendly worms and lowers the content of organic carbon in the soil, which results in low yield. Stubble burning not only pollutes the environment, but it also causes health ailments. Because of stubble burning, dense smoke even engulfs residential areas, thereby causing respiratory problems to inhabitants. Fumes of toxic smoke rise from the burning fields. They not only give rise to fog but agriculture experts say this pollution plays havoc with the environment of the area. The smoke emanating from the burning of stubble can lead to several health problems, including bronchitis, respiratory problems, skin ailments and conjunctivitis. Physician say stubble burning also depletes the red blood cell (RBC) count and adversely affects the oxygen-carrying capacity in the body. The burning of stubble leads to formation of thick clouds of smoke, which affect the visibility on the roads nearby, consequently putting the lives of motorists and bikers at risk. It is pertinent to mention that due of stubble burning, accident cases were also reported from various parts of the state. During the burning of stubble in the fields, “friendly” pests, which benefit the crops, also get killed. The fertility of the fields also decreases. Stubble burning near fuel stations, houses or trees may result in a major tragedy, resuting in loss of lives. People now are going in for other cash crops like ginger, arbi, and maize which are less labour intensive and also do not need much water. In the past too, rice cultivation was less but enough for many people to sell large quantities to wholesalers. There were many means, well-tested and developed with time, to make the best use of stubble as a fodder for cattle (it is to mention here that rice-straw is a fodder that is hard to digest. Cows, buffalos, goats and sheep cannot digest it easily). Every household had to have a minimum of two bullocks in those times, making rice bales. These were put to many uses, such as to collect many items like grass, maize, fire wood etc. from the fields to make cushions for sitting and sleeping. These were used in winter to help in firing the wood (it catches fire easily and sustains fire for longer period as compared to other lighting material). Covers for houses were made and many more uses as per the requirement and expertise of the people were found. There are many rice and wheat-producing states in India but it is true that stubble burning is more prevalent in Punjab and Haryana as compared to other rice-producing states in India. This menace is not there to such an extent in rice-producing states like Bihar, UP, MP, Tamil Nadu, Kerala and Andhra Pradesh. The extent to which the practice of paddy straw burning was affecting the air quality emerged from satellite images released by NASA, which showed large number of fires over agriculture fields of Punjab. People’s mindset and their use of rice straw in these states is still in coordination with its meaningful use. 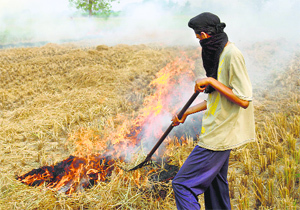 But farmers in Punjab and Haryana find burning of stubble the easiest way out to get rid of this waste product. Many countries like Vietnam, Japan, Korea (South & North), Malaysia, Indonesia and Philippines are the largest producers of rice, which is their staple food. But stubble burning is not a problem in these countries because they have taken recourse to technology for making best use of the stubble. No doubt, technological developments have provided many alternatives which can be put to use to make best use of waste rice straw. This includes making fire pallets from rice straw (charcoal), paper, cardboard, extracting oil and even using it for mushroom cultivation. It can also be cultivated into fields. An agriculture expert claims that farmers have an option to sow wheat with the help of zero-till drill, also called as “happy seeder”, rotavator or a roto-drill, cutting and mixing it with fodder. The burning of paddy stubble in the fields will soon be a matter of the past if biomass-based co-generation power plants are being set up in localities in which the paddy stubble, cotton sticks and other agricultural waste shall be used as fuel. Companies can collect biomass fuel from farmers within a viable radius or set up three fuel-collecting centres. Things have changed with time and now people do not have time for traditional art and craft. Mud houses have changed to concrete ones. Neither do farmers have the patience to collect the rice straw and convert it into useful end products and sell it to industries or factories, nor do they have the desire to use this agriculture waste efficiently. Farmers take the easy option of burning stubble instead of using these devices. They term burning as the cheapest and the easiest way to get rid of the stubble and prepare the field for the next crop. It is not that they do not acknowledge the harmful effect of this burning on the environment. Ultimately, they know that they are harming themselves only. the fact remains that the available choices are more unattractive to them in one way or the other and they are not motivated. It is not that farmers are reluctant to leave the practice. They themselves are the worst affected due to the burning of straw in fields and the consequences of the pollution thus caused. The farmers said they no other option but to burn the paddy to grow other crops. As the sun sets, one can notice the stubble in the fields along the roads being set on fire. There is no check or vigil by the officials concerned, especially during the night. Despite the ban on the burning of paddy stubble and availability of so-called technological alternatives, farmers will still continue to burn stubble as there is no other easy and cost-effective alternative. Private companies are charging a hefty amounts to collect the stubble as well as to hire out the machinery. Buying and using machinery on hire for stubble collection is not economical, even if the farmers buy it collectively. The farmers say that it is the lignin and silica in the stubble which prevent it from developing into cattle feed. The problem arises when the stubble fails to decompose due to the low temperature and it requires a spray of chemicals for the stubble to decompose. On the transportation of paddy for biomass, the farmers’ regret is that it requires labourers to chop the stubble and pack it to far-off places. The need is to develop cost-effective machines that chop the stubble and then distribute it in the fields. There is an immediate need to create awareness among farmers not on the issue of burning stubble but how to make best use of it at a low cost and with less labour. Unless and until farmers are made aware about the ill-effects of stubble burning as well as offered other easier alternatives available that can help them to get rid of waste stubble and also enable them to earn some money without hard work, the practice will continue. There is a need to develop a market for stubble collection from fields and use it to make byproducts. NGOs can thus be roped in to procure the stubble from fields as was done in the milk revolution.